In a medium sauce pan combine milk and sugar. Warm slowly over low-medium heat. In a separate, heat safe bowl whisk egg yolks thoroughly. Slowly whisk in 2-3 large ladles of warmed milk into egg yolks, continue whisking and pour milk & yolks back into sauce pan. Stirring constantly heat on medium until mixture begins to thicken to the point it will coat the back of a wooden spoon (much like a custard). Slowly poor warmed mixture into bowl filled with cold cream. Add Whiskey, maple syrup and salt whisky continuously. Place bowl in refrigerator and allow to chill thoroughly. Freeze in Ice-Cream container as per original manufacturer's directions. 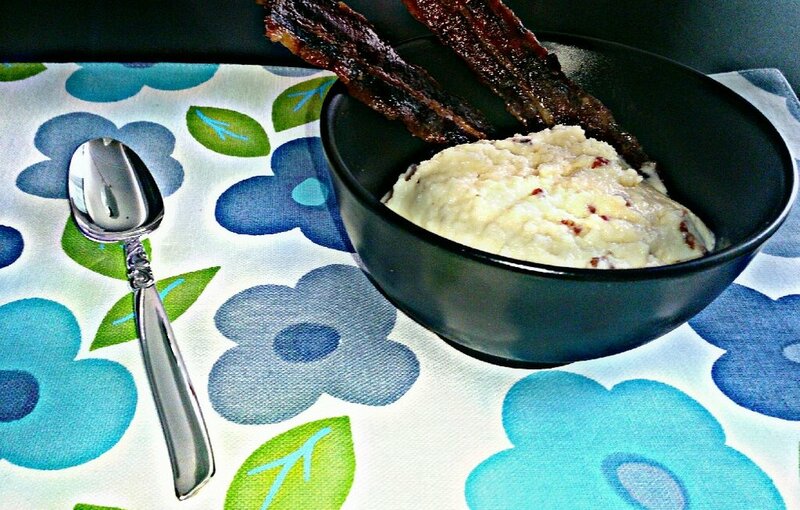 When Ice cream has almost set add finely chopped candied bacon. Coat Tomatoes and Onions (and hot peppers) in olive oil and roast over grill until charred. Allow to cool then dice. Mix in parsley/cilantro, salt and pepper. Spritz with freshly squeezed lemon juice. In a bowl combine juices, garlic, salt and oregano. "Butterfly" your pork loin chops, and marinate in mixture for 1 - 1.5 hrs. Grill over an open flame until fully cooked. Plate chops and salsa with delicious sliced avocado and serve. Using a pot of salted water boil potatoes until tender and drain. Add butter and begin mashing. When potatoes have been mashed coarsely add cream and continue mashing until a smooth and creamy consistency has been reached. Season with salt and pepper to taste and set aside in an icing/ pastry bag equipped with a large star tip. In a medium saucepan melt the butter and add shallots. Saute over medium heat until shallots have softened. Add flour and continue cooking for 1 minute, stirring continuously. Add white wine and milk, bring to boil. Continue to whisk while cooking sauce for another minute. Adding shrimp continue to stir over medium heat for 1 minute. Add scallops, continuously stirring for another minute. Remove from heat, stir in Gruyere and allow cheese to melt. Spoon the filling into traditional shell or gratin dishes. Using pastry bag garnish rim of dish with mashed potatoes, sprinkle remaining cheese over top and bake at 350 for 10 minutes. To finish broil until cheese and potatoes have reached a golden brown. Brown beef cubes over medium heat. Wash and chop vegetables to preferred size. Caramelize onions, carrots and celery on stove top. Add beef cubes, potatoes and caramelized vegetables to crock pot. Pour in Guiness and mix dry ingredients EXCEPT cornstarch, stir. Add water until crock pot is full and carefully stir again. Cover and set your slowcooker to low for 8-9hrs cooking time or high for 4-5hrs cooking time. Thicken stew just before serving by dissolving cornstarch in 1/3 cup of water and very slowly mixing into stew, continue to stir briefly. Stew will begin to thicken in approx 5-7min. Plate and serve with a traditional Irish Soda Bread, or other "crusty" type bread. Peel and cube potatoes, add to pot of water and boil until tender (kitchen tip: add a tsp of butter/ margarine/ oil to prevent the starch from the potatoes boiling over). While potatoes are cooking, in a large saucepan brown ground beef over medium-high heat. 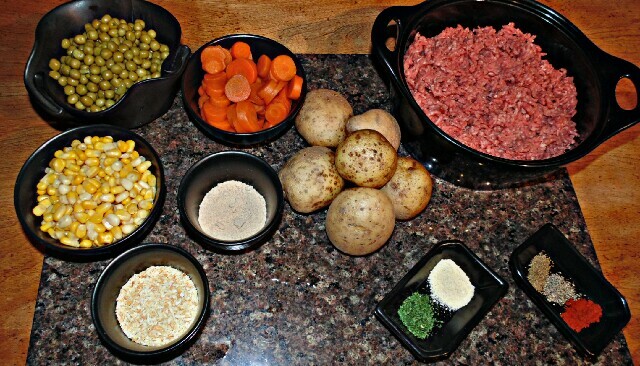 Once ground beef is fully cooked add 1 1/2 cups of water and dry ingredients, stir while bringing water to boil. Reduce heat and simmer until all water has evaporated. Once potatoes have finished drain all water, add milk, shredded cheese and butter. Mash potatoes until a creamy texture has been reached. 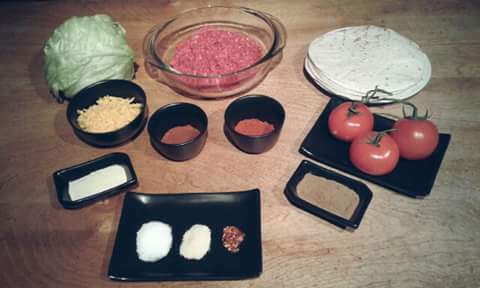 In a large casserole dish layer ingredients starting with the ground beef, followed by a layer of vegetables. Using a wooden spoon or silicone spatula smooth mashed potatoes on top and spread across surface. Sprinkle remainder of shredded cheese over potatoes. Place dish in oven on broil for 10min or until cheese has browned and potatoes have a crust over them. Remove from oven, plate and serve. In a large skillet brown ground beef over medium-high heat. Combine all dry ingredients in a small mixing bowl. Mix 2/3 cups of water and 3 tablespoons of taco seasoning per pound of ground beef in skillet, allow to simmer 3-5min (or until water is no longer visible). Combine dry ingredients in a large mixing bowl. Add garlic, onion, and ginger. Stir in lemon juice and continue stirring until dry ingredients dissolve. In a small bowl combine minced garlic, chopped parsley, and butter, mix well. Separate half of garlic butter into frying pan, reserve remainder. Set at medium heat, add shrimp. Stir in white wine and lemon juice, allowing shrimp to simmer until cooked. You will know shrimp is fully cooked when it turns a pinkish colour, is no longer opaque, and curls into a tight C- shape. 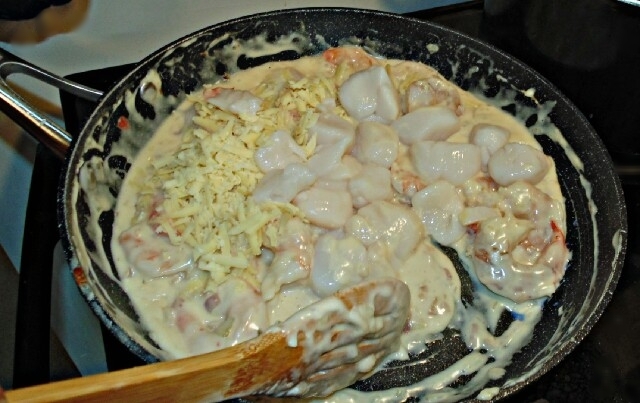 Remove shrimp and continue reducing garlic butter mixture (5-10 min on mid-low). Return shrimp to reduction and allow to marinate before plating. Brush Tenderloins with oil, season with salt and pepper to taste. Sear Tenderloins on high ( grill at 450 -500 degrees for 1min each side), repeat process each side, then remove from heat. Allow tenderloins to rest 10-15min while reducing grill temperature to medium (300-350 degrees). Return meat to grill and cook to preference ( here's a link to a handy way of telling how well done your steak is without use of a thermometer or having to cut into meat, preserving its full flavour and juices). Plate Shrimp and Tenderloin, using the remainder of garlic butter to top steak. We chose to pair our Surf and Turf with a traditional side of mashed potatoes and steamed asparagus spears.